Amanda and I have been incredibly lucky with the men in our lives - both our better halves are ridiculously thoughtful, caring and generous people. 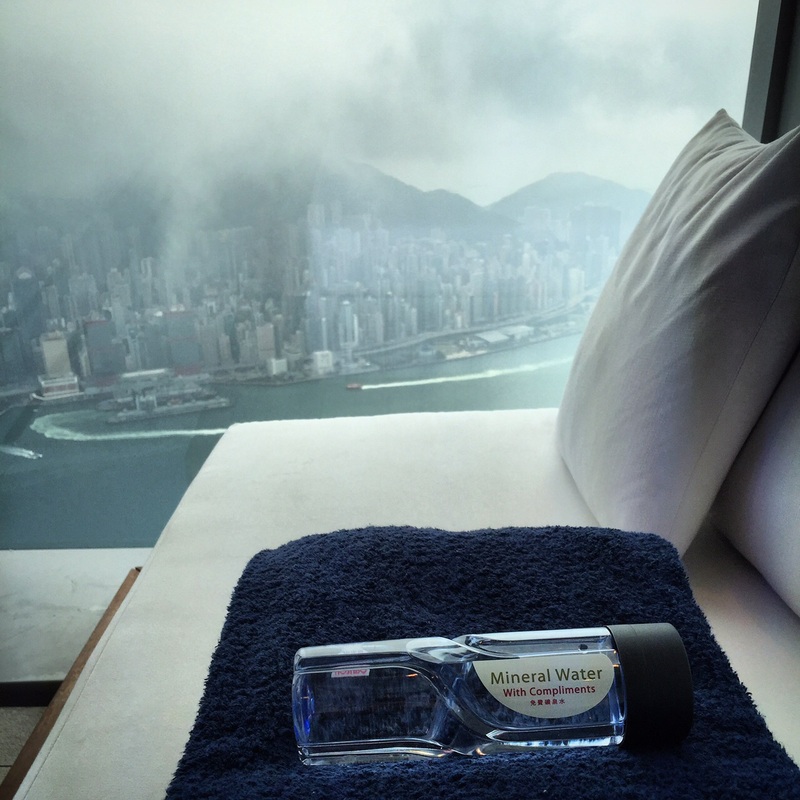 So it comes as no surprise to anyone (but myself) when my boyfriend booked me in for a three hour "Me Time" spa treatment (HK$3,600 plus 10% service charge) at the Ritz Carlton by ESPA in Hong Kong. Situated in a stunning location on the 116th floor of the Ritz Carlton, the spa has a floor-to-ceiling panoramic view of the entire Victoria Harbour and Hong Kong skyline, and feels like an urban wellness retreat far away from the usual chaos of Hong Kong. 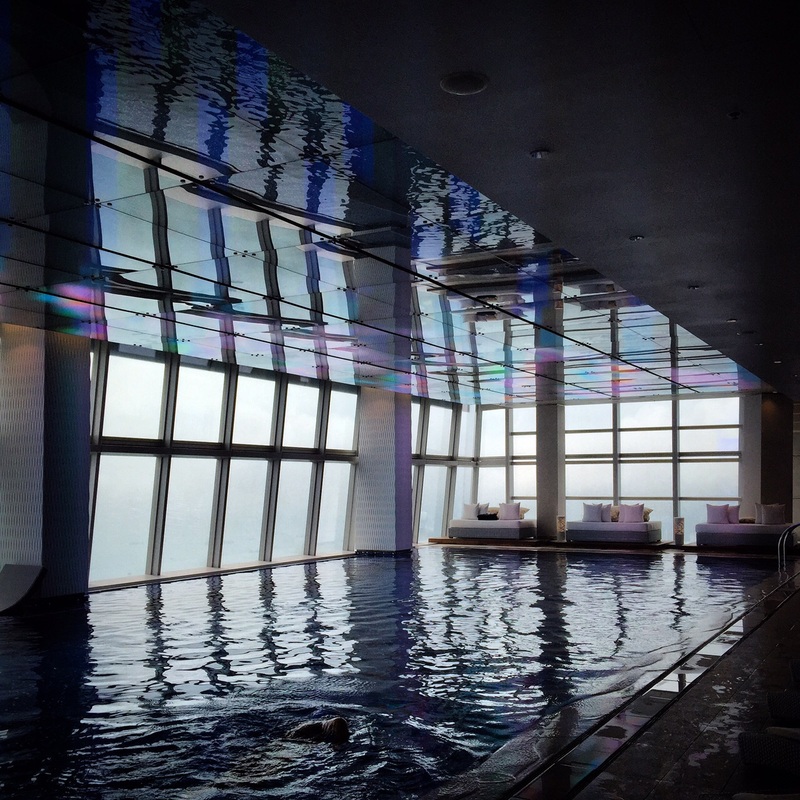 When we arrived, I was shown to the upstairs facilities, which includes a steam room, various indoor and outdoor pools overlooking the harbour, and hot (and cold) tubs. There were interesting light displays on the LCD screen at the end of the pool which keep me entertained with their flickering lights across the pool surface. 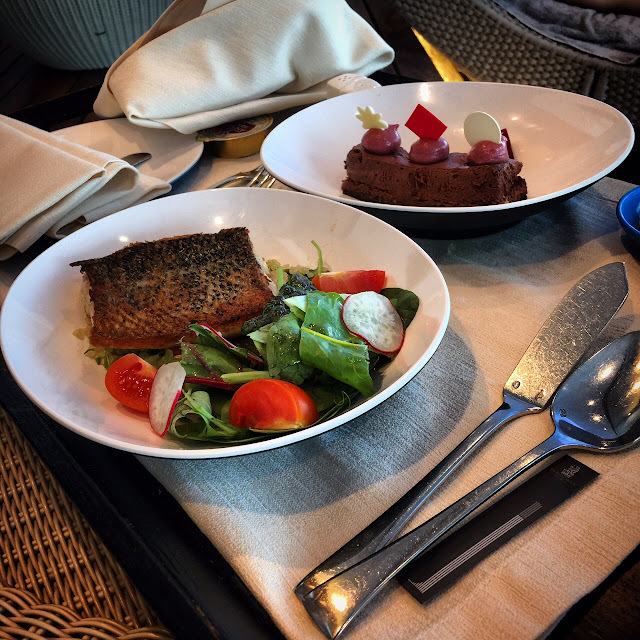 We were served lunch (which comes included in the spa treatment) beside the indoor pool and I picked the grilled salmon with salad, accompanied by a chocolate cake. Although the butter bun roll was delicious and the salmon was light and refreshing (albeit a bit luke warm), the dessert was surprisingly bland. When I did emerge downstairs at the spa, I was given a choice of a 90 minute massage (aromatherapy, Swedish, traditional Oriental, or a 60 min skin wellness massage) and 30 mins of other treatments including a foot cocktail, beautiful eye treatment, and aromatherapy body polish. On top of this, I would receive a 60 minute customised facial. The treatment rooms are spacious and dark, with a shower en suite inside. I was given a warm foot bath while I chose between two massage oil scents (I went with the lemongrass), before hopping on the treatment table for my 90 minute Swedish massage. The therapist was great - the massage was even handed and smooth while working out the tension all over my body, and the oil smelt divine. Afterwards, I was asked to have a shower in the en suite bathroom, and then given a 60 minute customised facial, which included a skin consultation from the beginning. Although my therapist politely refused to do any extractions for me (as it is against ESPA policy), she gave me an extra thorough exfoliation to ensure that the top layers of the skin were clear. Given that my skin was feeling rather dry and required more hydration, she offered to apply the eye treatment on me while also applying an additional face mask to lock in moisture, which was greatly appreciated. From the treatment room, I was then lead to the resting area, with another panoramic view (of the side) of Hong Kong. Although I was not impressed by the muesli cookies, the chocolate mousse in the fridge was divine! 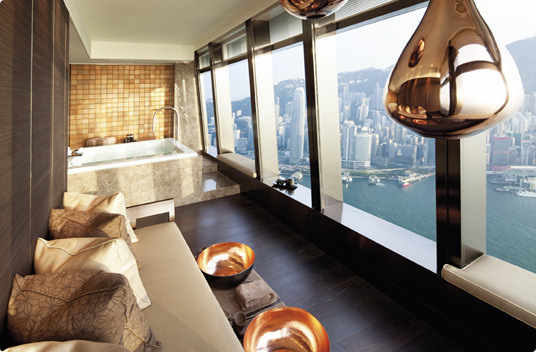 I would highly recommend the ESPA at the Ritz Carlton Hong Kong. Although the lunch has room for improvement (so perhaps don't choose the treatments with lunch included), the view itself from the top of the Ritz, combined with extensive pool facilities and the expertise of the therapists, made the entire experience worth the money (easily said I guess when I'm not the one paying for it, hehe!). Thanks for sharing. I think it is a great place. I've been there almost a year ago. I liked it very much. I think it was my second favorite place, after http://wellcum.at/en/.